Aston Barclay Prees Heath has made a historic start to the year breaking a 20-year old company record. It’s Wednesday fleet sale, the inaugural sale for Santander, sold 290 units, the highest number sold in a single day at the site, since Aston Barclay acquired Prees Heath Motor Auctions in 1998, for leading vendors including Alphabet, Zenith, LeasePlan and PSA Group. The Shropshire based auction has seen a buoyant start to the year with buyers coming out keen to replace stock sold over the festive period. Santander’s first sale at Prees was an added attraction for buyers. The record breaking sale saw Santander and PSA stock achieve a 100% conversion rate with used fleet prices averaging between 98-100% of CAP. Throughout the day, a total of 27% of bids were submitted via the group’s online platforms with a total of 11% of bidders accessing the sales online on desktop and mobile via the Buyer’s App. In total 39% of the newly offered Santander vehicles were sold to remote bidders. 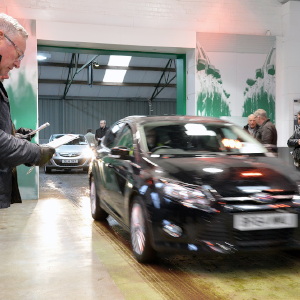 “The weekly fleet sale at Prees has continued to grow in popularity year-on-year with both vendors and buyers alike making it one of the most respected auction centres in the UK. “We have been working with the local council to look at ways of developing the Prees Heath site over the coming year to cater for this increased demand and we are confident the expanded site will bring great benefits to the local community with new jobs and investment,” said Martin Potter, Aston Barclay’s group operations director. The leading independent auction groups’ success at Prees Heath is in part due to wider national investment in Buyer Services that ensures trade buyers can access the used vehicle stock they require to run their own dealerships. Vendors meanwhile continue to receive the leading levels of service that have allowed the group to grow and flourish at Prees Heath and it’s four other remarketing centres.